A smart parking project’s primary objective is to make finding a parking space easier, but the reasons for setting this goal vary depending on the problems a community faces. San Francisco’s smart parking project SFpark made supporting economic development the primary goal. Store owners often complained that it was difficult for their customers to find a place to park. If customers can’t park, they can’t buy anything, and shopkeepers are impacted. To solve this problem, SFpark aimed their smart parking project at managing demand for parking spots so that people, when they choose to drive, rarely had to circle a block to find parking. Another challenge was the scope of the project. San Francisco has 441,530 parking spots. 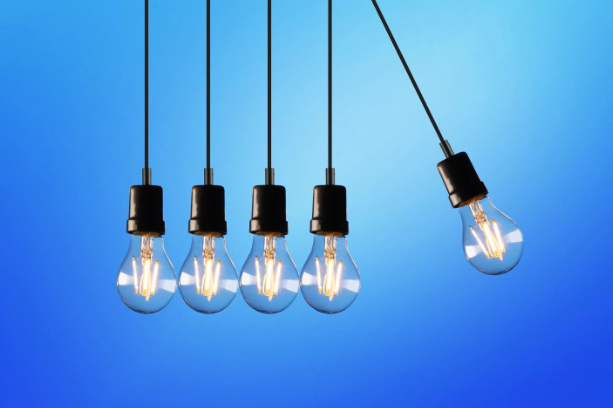 Managing these spaces and the amount of data collected requires much more than a simple database: it needed a big data business intelligence strategy. SFpark had a unique way of looking at parking spots and considered them assets. In doing so, they could determine what the return on those assets would be. In a business, return on assets is a critical KPI and a vital measure of a company’s wisdom and management strength. The measures of return on assets may not always be financial, as in the case of SFpark. SFpark looked beyond a simple financial return on assets and considered other goals and strategies for their smart parking initiative. Demand responsive pricing to meet occupancy goals (lower rates): Unlike some private sector parking lots, SFpark wanted to adjust the price of parking to find the lowest rate possible to achieve availability targets. Meet occupancy goals to make it easier to find parking: A primary strategy of SFpark was to dynamically adjust parking rates based on occupancy. Their goal was to always have 2 to 3 parking spots in any block available. However, the price of these parking spots would be very high. The goal was to make a parking spot available, but to encourage people to leave it as quickly as possible. Easier payment methods: SFpark implemented new parking meters that accepted coin, credit cards, and a SFMTA parking card as well as the ability to pay by phone. More extended time limits: SFpark eliminated parking time frames in several areas and in others extended it to four hours. They chose to use dynamically adjusting rates rather than inconvenient time limits as the primary tool for creating parking availability. Fewer parking tickets: By making it easier to pay and extending the parking time limits, it was easier for drivers to avoid parking tickets. 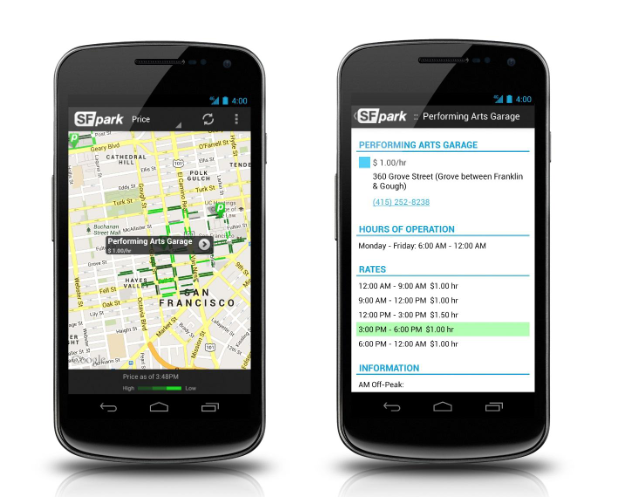 Better parking information: SFpark enables drivers to find spaces with a combination of real-time and static data using a mobile application. Reduced illegal parking: Because there is always a parking spot available (even though it is expensive), fewer drivers are tempted to double park, park illegally in bike lanes or sidewalks or in front of hydrants or driveways. Increase funding for transit: Although the goal of the SFpark project was not to increase revenue, it still happened. This additional revenue is helping pay for the operation of the public transit system. 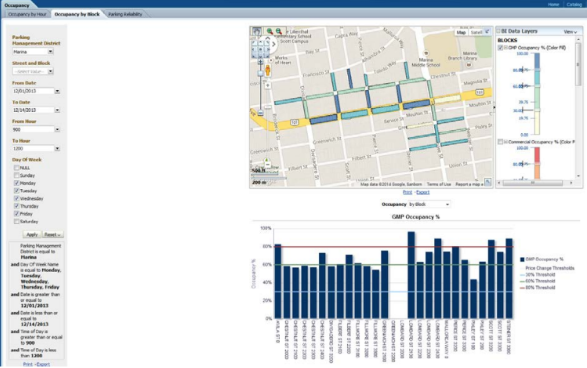 Below are some examples of the SFpark smart parking big data business Intelligence reports that were used to accomplish some of the capabilities presented above. The ability to develop a solid parking transformation strategy starts by understanding the actual current use of the parking spot inventory. 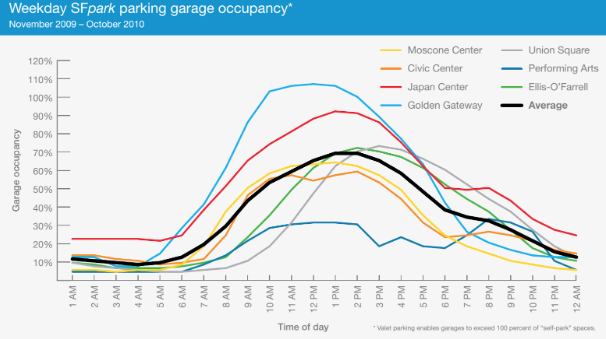 This is an example of SFpark’s parking garage occupancy analysis report. This example highlights SFpark’s ability to drill down on specific parking spot/area/district occupancy. Here is the detailed analysis of citations per metered parking spot. Drivers are mobile, and so a mobile guidance solution is mandatory to guide drivers to available parking. 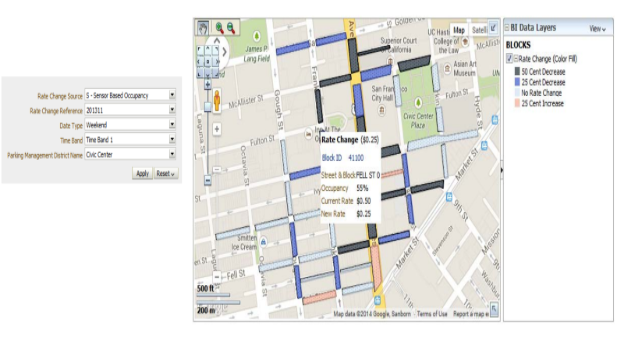 Here is an example of the parking information application that SFpark has implemented based on real-time data analysis. 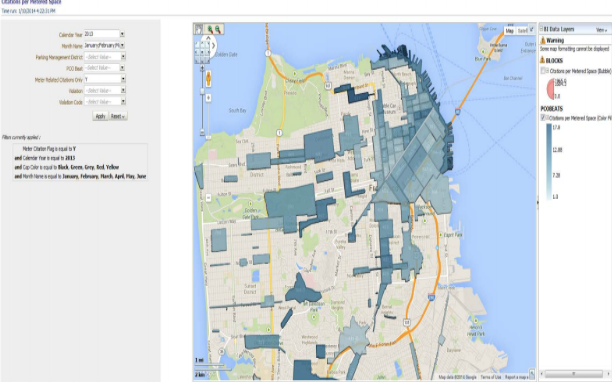 This example shows SFpark’s ability to predict the impact of parking rates on occupancy. This report enables SFpark to generate occupancy rate recommendations. I have only scratched the surface of how big data business intelligence technology can help you accomplish your smart parking goals. 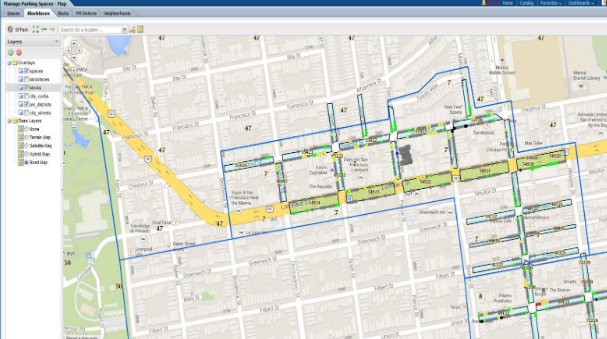 In our next blog, we will continue to examine additional case studies on how big data business intelligence analytics can help you improve your parking revenue.